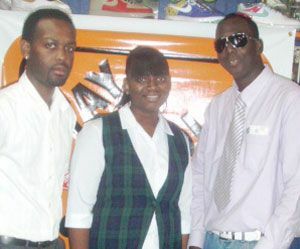 Cambridge, who wrote on the topic âIs Bob Marley the father of Reggae Music?â, collected her winnings last Tuesday at Foreign Brand Name Outlet from Managing Director of Caribbeanradio.FM Kishore Shallow and Manager of Foreign Brand Name Outlet Quincy âForeignâ Lewis. The 17-year-old lass said that she is going to use the money to open a bank account at the National Commercial Bank. A second year student currently studying Spanish and Law at the SVCC, Cambridge said that she is a regular listener of Caribbeanradio.FM. âI would like to thank the organizers because I feel real good about winning the competition,â said Cambridge who hails from Greggs. Caribbeanradio.FM. is an online radio station which is connected to a server in Europe and streams music on line. Five local discs jockeys play on the station, along with other DJâs from the UK.